Three weeks ago, I volunteered to drive my niece to her appointment in Oakland. 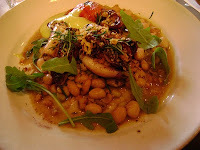 Somehow, I found myself driving on Highway 13 toward the northern section of Shattuck Avenue – Berkeley’s gourmet ghetto. Since we were in the area, I thought I would grab some cheese from Cheeseboard and order ‘pizza to go’ from the pizzeria next door. As I pulled over to park my car, the towering monkey puzzle tree caught my eye. Suddenly, I felt a pang of hunger for tarte tatin or call it nostalgia for I remember having the best dessert from the restaurant hidden behind the monkey puzzle tree. We walked across the street and squeezed into Chez Panisse, where the maître d’ greeted us with, “Do you have a reservation? Sorry, we’re fully booked.” Since it was rather late for lunch, I thought the maître d’ would be able to accommodate us if I told her we would order dessert and coffee only. She said, “It’s not that I don’t have food to serve you, the problem is that I don’t have a table.” As if to take no for an answer, we lingered around to savor the aroma of food emanating from the open kitchen. Twenty minutes later, we were eating California white-sea bass with sweet corn, snap peas and tomatillo salsa; Grilled Montery squid with beans and greens; and raspberry tarte with eau de vie crème for dessert. 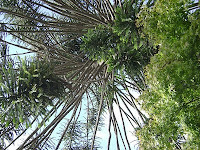 Located at 1517 Shattuck Ave, Berkeley, California, Chez Panisse is not that visible from the street, so look for the towering monkey puzzle tree. The ambiance is rustic. It’s wood and warm inside with small square tables. In addition to the square tables, you’ll find banquette tables adjacent to the open kitchen. This restaurant has a bistro setting, in that the small square tables are closer together so you will be able to hear the conversation from the next table or peer into the other diner’s meal. It’s very unassuming and stripped of decorations except for a couple of posters, one of which is a poster of Marcel Pagnol 1935 movie trilogy. I learned about the significance of the poster later. The restaurant was named after one of the characters, Honore Panisse, as an homage to the sentiment, comedy, and informality of the classic film. As a foodie, I’ve eaten in both the restaurant downstairs and the upstairs café a few times. The upstairs café is open for lunch and dinner and offers moderately priced a la carte menu. The restaurant downstairs is open for dinner only and serves pre-fixed menu, consisting of 3-4 courses. The restaurant prices range from $60.00 to $95.00 depending on the day. I went to dinner at the restaurant downstairs with a friend who was more of a wine than food enthusiast. He thought the restaurant was rather pricey. 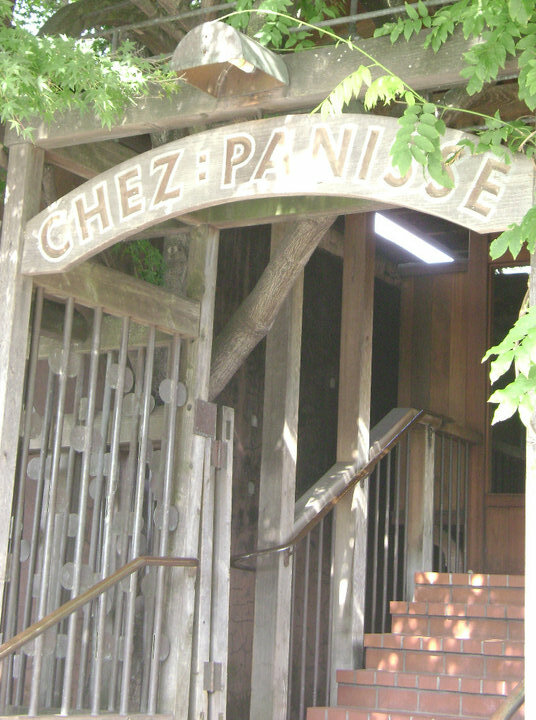 Chez Panisse was co-founded by Alice Waters in 1971 (she is now the sole proprietor), on the principle that cooking should be based on the freshest ingredients and locally grown. “Vegetables fresh from the garden, fruit right off the branch and fish straight from the sea” are the best tasting foods. The spirit from which the restaurant was founded is still as alive today. On the menu, you will notice the predominance of local produce added to the meat or fish or any dish. For example, Monterey (any fish or any meat) with green beans, cipollini, and squash blossoms, sweet corn, tomato, tomatillo, peppers, and eggplant. Any vegetables and fruits you can imagine, if they’re in season, will end up on the menu. The restaurant is still popular and still difficult to book. I thought it would be a treat for the food enthusiasts to eat here on their birthdays. So I tried to make a reservation to the restaurant downstairs through opentable.com, but the system kept giving me an alternate date and time. I called and ended up making a lunch reservation at the café upstairs. We went back the following Friday for a birthday celebration. We were seated at the banquette table across the open kitchen. Since we had a 5-year-old (another food lover) in our party, the waiter provided her with crayons to doodle on the paper mat. The restaurant was full and busy; the waiters frenetic; the service slow. Everybody joined the 5-year old doodling. I was getting inpatient. I ordered a plate of olives and asked for more bread. The other two did not mind the long wait. They found all the activities in the kitchen, especially the pizza maker (do you call the pizza maker here a chef), amusing. For our main course, we ordered the grilled yellow tail, squid and soul food farm chicken and pizza. The little girl hardly touched her pizza and started to complain about her tooth. (I thought she was full from eating the crusty bread). But when the ‘chocolate pavé with caramel chocolate-almond ice cream dessert’ arrived, the little girl’s eyes light up with enthusiasm. Both toothache and dessert suddenly gone! Never mind the slow service! We are food enthusiasts after all, we are here to eat and enjoy the food and the food here never disappoint. It was nearly 4:00pm when we finished our meal and most of the customers had already left. Alice Waters, who I spotted earlier talking to an employee in the dining area, walked toward the open kitchen to talk to the chefs. Apparently she is very much involved in the food and restaurant operation. Despite my displeasure over the service that day, I could not bring myself to complain to Alice. Instead, I interrupted Alice’s conversation with the chef so I could tell her that “I’m a big fan”. She is, after all, the woman credited for California cuisine; for her culinary innovation such as the ‘wood-fired pizza’; for introducing goat-cheese and organic produce to our local restaurants; and for doing away with bottled water at Chez Panisse. The mother of slow food movement, she is arguably responsible for the upsurge in restaurants that offer organic, local and sustainable food, and she has influenced and inspired many chefs to feature new exotic dishes in their restaurants, turning the San Francisco Bay area into a ‘foodie’ heaven. It’s ironic that locally grown, organic foods are getting so expensive and not affordable for so many. This made me question the viability of the slow food movement. But I still give Alice Waters credit for bringing it to the forefront of discussion, especially in this tough economic environment when creativity in finding cheaper alternative is needed the most. I may not be going back to eating out anytime soon, but I left the restaurant feeling good and connected. 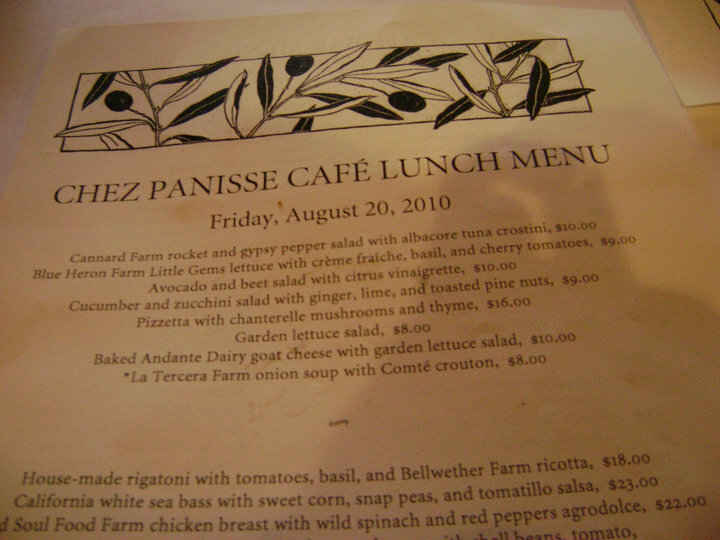 I have Chez Panisse to thank for introducing me to all those ‘weird-sounding' fruits and vegetables. Who would have thought that ‘kumquat’ has a place in my vocabulary of food. It feels good to know that as an alternative to eating out, I can prepare my own dish at home such as crab salad with kumquats picked from brother’s backyard. 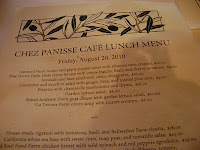 Chez Panisse, the restaurant that changed the way America eats indeed! Note: The title of this blog has been lifted from the book, "1,000 Places To See Before You Die", page 582.